The login has changed to a more common behaviour. When you need to make a login, there is not shown a button for that anymore. Just click the "Log In" text and you will see the normal log in screen. Once logged in, you will see the logged in name and a little triangle. If you click the name/triangle you will see the option to log out, and the option to change your profile. From version 4.7 : Through the introduction of a side menu, the number of buttons on the right side of the navigation bar has been reduced significantly. The majority of the buttons has been replaced by one 'hamburger' button, which when selected will open the side menu. The menu items shown in the side menu depend on the current page and the user rights. This gain of space is especially important when the calendar is shown on a display or in an area with a limited width. When logged in as admin, The sidemenu will look like the menu to the left. When in public view, the menu will look like the sidemenu to the right. 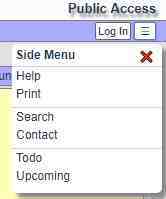 When logged in as a manager, there will be more menu items available than in public view, but only admin has access to all menus. When logged in, you can use the Add-button to add new events. You can follow the "old" menu structure in the left-menu, and the "new" structure in the right menu. In the right menu, the items will be shown in pop-up boxes. The menu to the left, follows the structure for the "old" menu and buttons. To the right in the navigation bar are a set of buttons. The presence of the buttons, depends on Your credentials, and if You are logged in, or not.